Add the onion and garlic to butter, sautee and add carrots and celery. Throw in the ham to flavor the vegetables. Let cook for at least 30-40 minutes and once the lentils are soft, add the seasonings. Let cook until Lentils are completely soft. 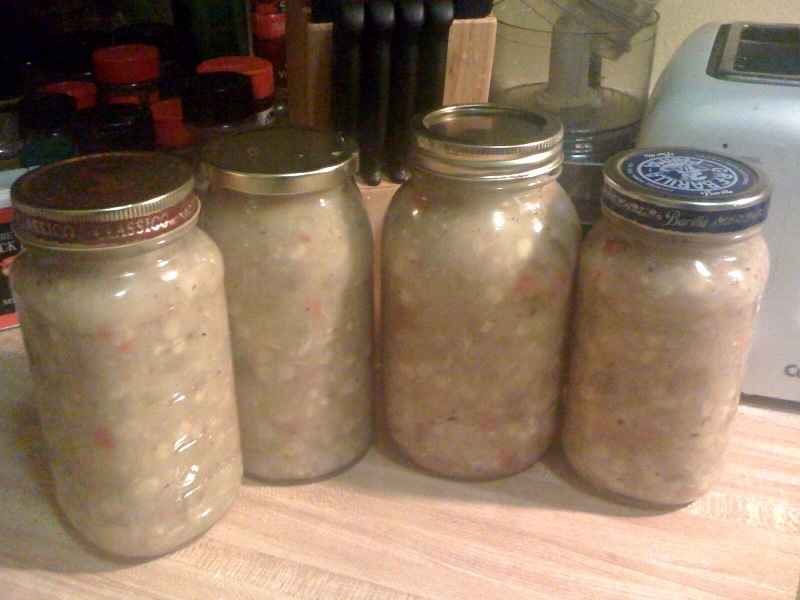 Tis the season of cold weather and soups. 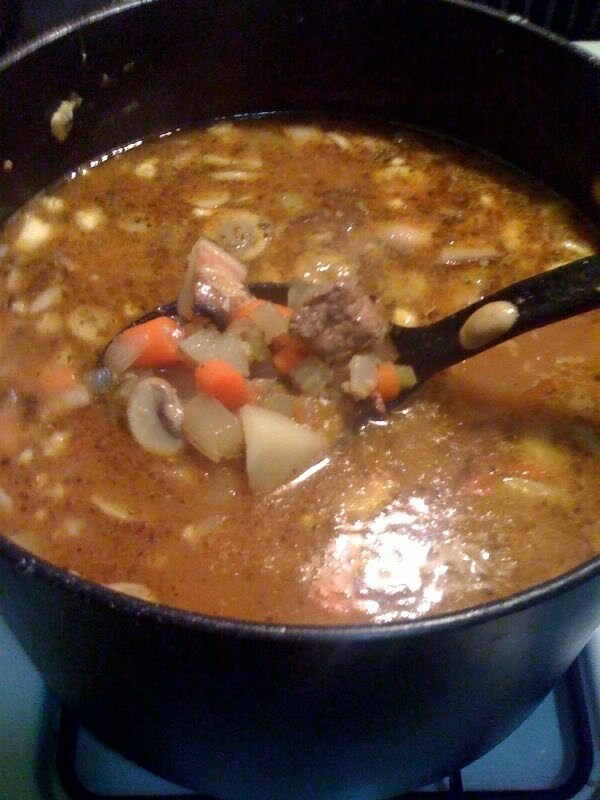 I made this soup on the fly and probably spent about $4-5.00 for all of the ingredients used. Serves 10-12. Heat the oil in heavy large pot over medium-high heat. Start with diced pancetta and olive oil. Add the celery, carrots, onion, garlic, rosemary, and oregano to the pot. Saute until the onions are translucent, about 8 minutes. Add the broth and tomatoes with their juice. Bring the soup to a boil. Reduce the heat to medium-low. Cover and simmer about 30 minutes, add the lentils. Cover and continue simmering until the lentils are tender, about 40 minutes. Stir in the parsley. Season the soup, to taste, with salt and pepper. Ladle the soup into bowls and serve. I think I’m turning this into a soup blog. No, I really need to switch it up a bit. 🙂 I’m not sure how I started making Chicken Noodle soup, which recipe I started with and how it tasted. I know what I like now and make up my own recipes as I go along. * 1/2 box of noodles, your choice. I chose rotini and shells. 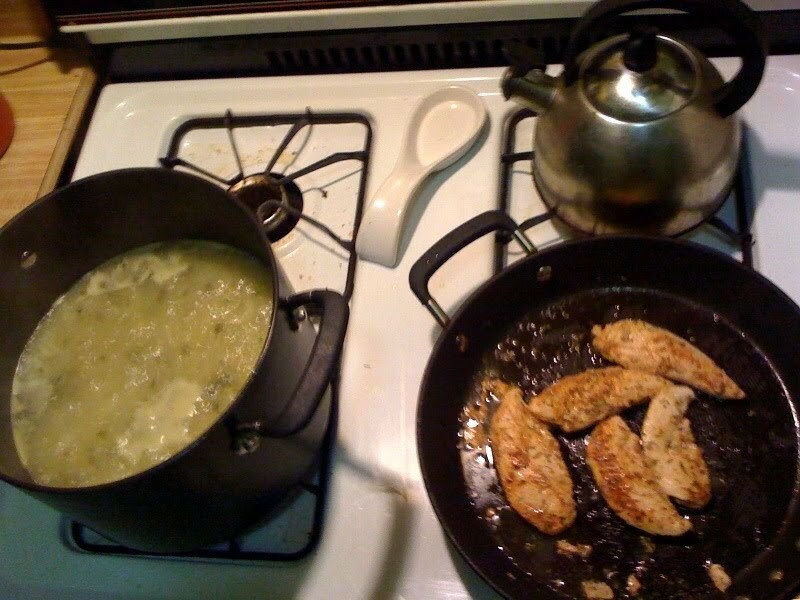 * 2 1/2 cups shredded cooked chicken ( 4 Breast tenders or 2 breasts) seasoned. Put the onion, celery, garlic, parsley and sautee in butter, cooking vegetables slightly. Add bay leaves and dried herbs to season them. 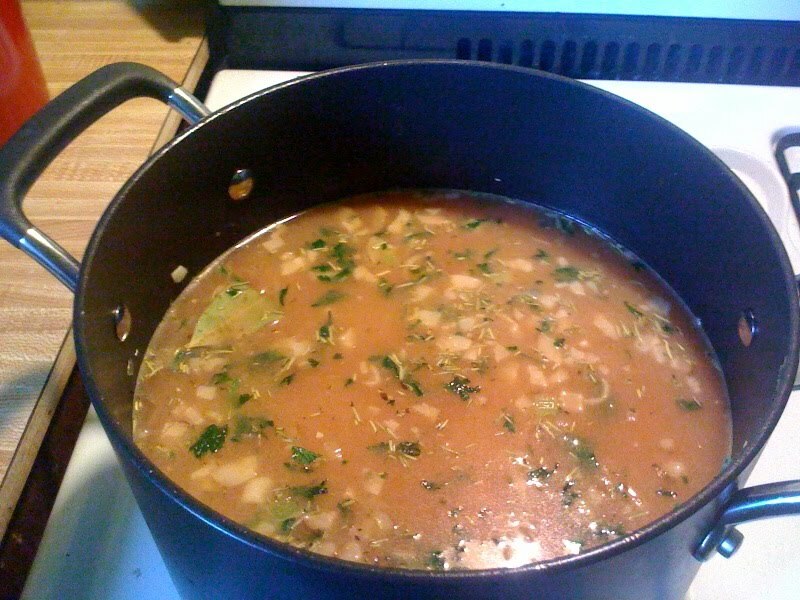 Once those have a head start, add the chicken broth, and water in a medium to large pot. Season with salt, cayenne (if you choose) and pepper, to taste, and bring to a simmer over medium high heat. Simmer until the vegetables are almost tender, about 5-10 minutes. Add the noodles and cook until tender, 5 to 8 minutes (depending upon the size of the noodles). Meanwhile I usually season the chicken breasts with lemon pepper and cayenne and fry those whole. Once they are cooked yet tender – I shred the chicken into bit size pieces. Making sure they pull all the seasoning in and are cooked. Add the chicken and turn off the heat. Let the broth, chicken and noodles combine together. I add in the juice and pulp of one large lemon. I prefer Meyer Lemons, sweet and tangy. This was one of my favorite soups. Usually I share a couple bottles with family and friends, but I ate this one myself. When I made citrus crab last night, I thought about making this soup. I’ve never made it before, but had it several times. I looked up several recipes and decided to try it out. 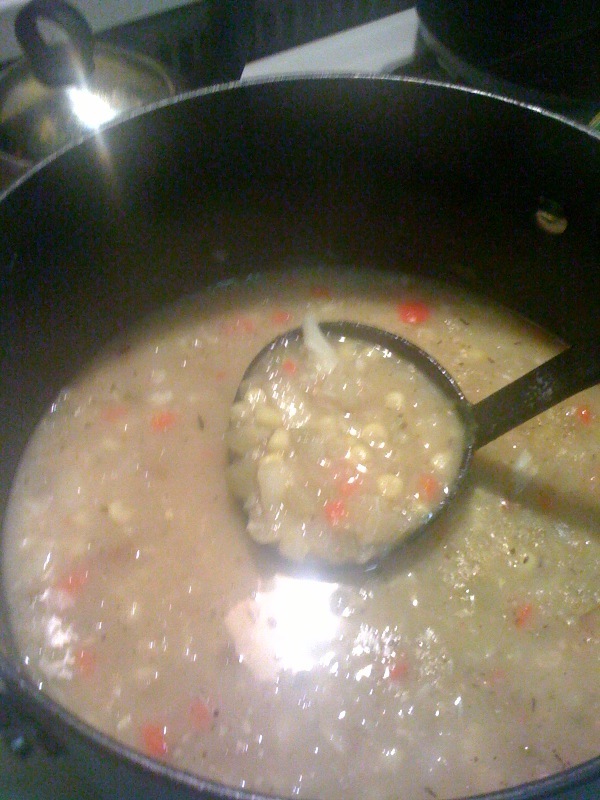 I wanted to make a lighter dairy free soup, so I used potatoes ans mashed them in the pot with the corn to thicken it up. I’m not even sure it is technically considered a chowder, but it’s fantastic. I know I may be a little bacon crazy these days, but I think bacon would make this one even more amazing. Heat a deep pot over moderate heat. Add butter and garlic. As you chop your veggies, add them to the pot: potatoes, celery, onion, and red bell pepper. Season vegetables with salt and pepper, cayenne and Italian Seasonings. Saute veggies 5 minutes, then sprinkle in flour. Cook flour 2 minutes, stirring constantly. Stir in broth and combine. Add corn and let boil down, mash soup with a potato masher to thicken. It’s really tasty and non-creamy. it’s hearty but still has that sweet corn flavor with bits of crab. It’s one of my new favorite soups and I’m glad I made enough to go around. 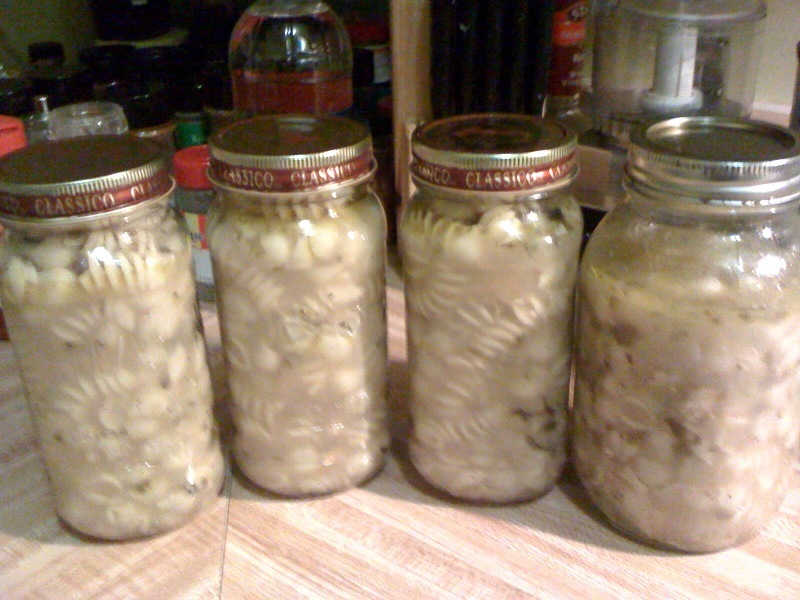 I tend to mold my recipes after what I have in my fridge. This is how my Grandma taught me to cook and the basis for a lot of my ideas and experimentation with food. You make what you have and try not to waste your resources. I also get inspiration from fresh, local produce from farmers markets or backyards when available. I came up with this crab dish last night. I purchased a live crab, which I had quartered and cleaned. I usually use white wine as a base, it helps cook the crab and gives it a great flavor. 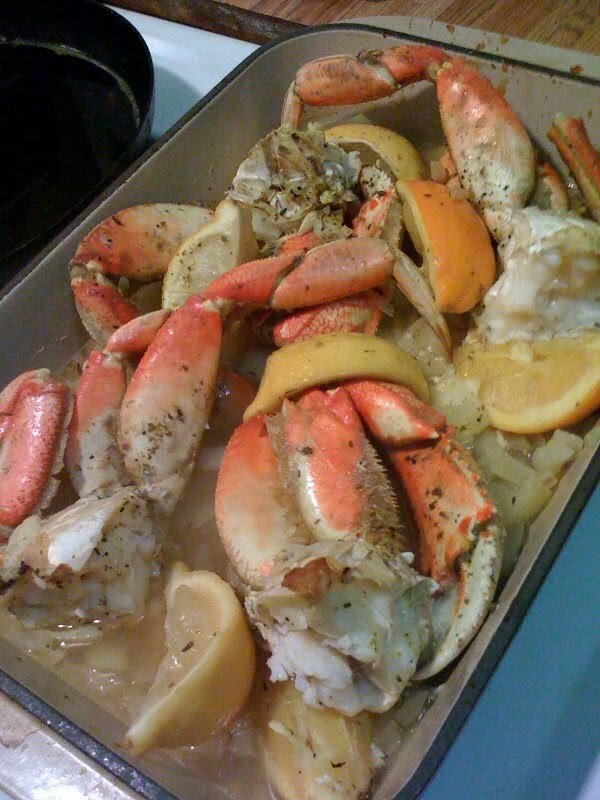 But I was out of wine, so I made Citrus Crab. Mix all ingredients and bake in the oven at 350 degrees for 30-40 minutes, flipping once 3/4 of the way through. Dungeness Crabs turn from a dark blueish purple to a bright pink. 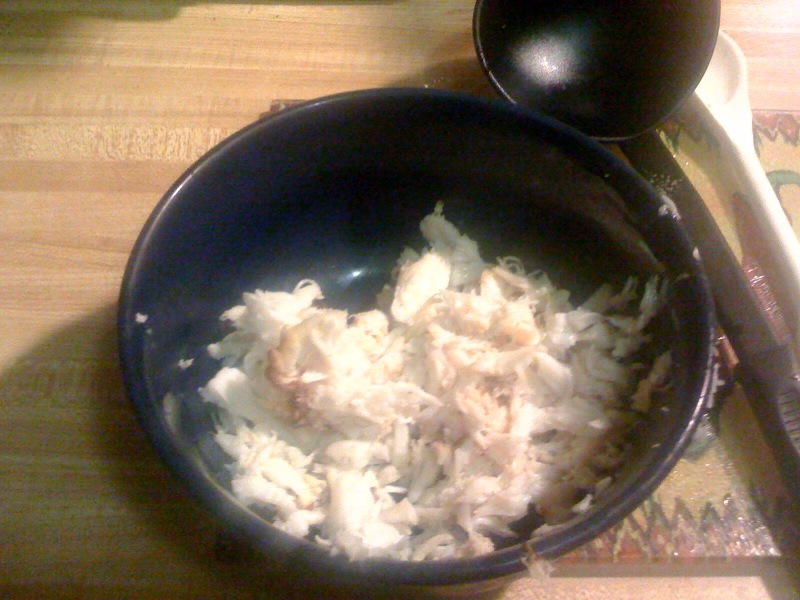 The juices are usually boiling and once cooled, delicious for dipping the crab in. 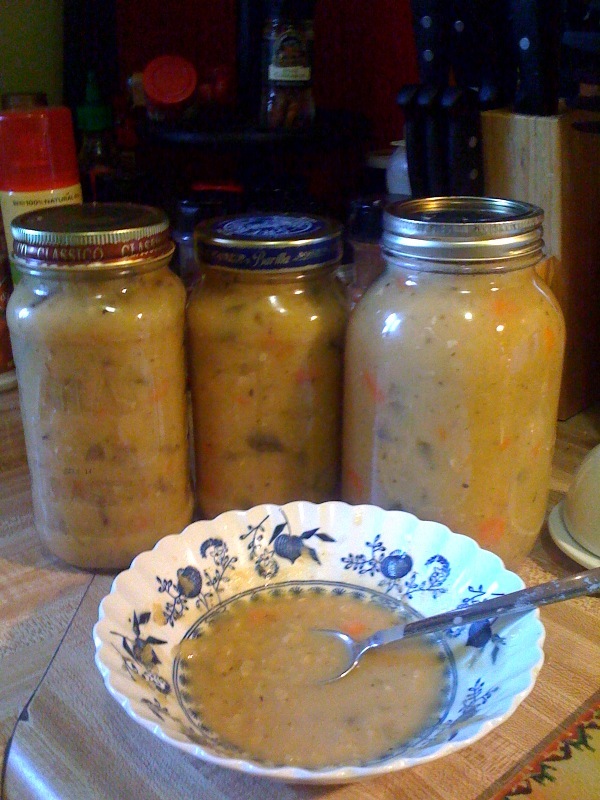 One of my favorite soups has always been Split Pea. It’s cold out, the holiday season and I’ve been home nursing a cough and making soups. 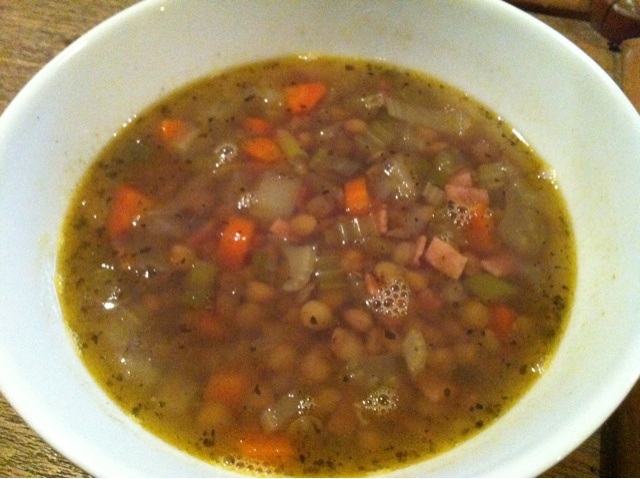 I had some leftover Black Forest Bacon and decided to experiment with the traditional recipe for Split Pea. Place bacon in a large pot, sautee with butter. 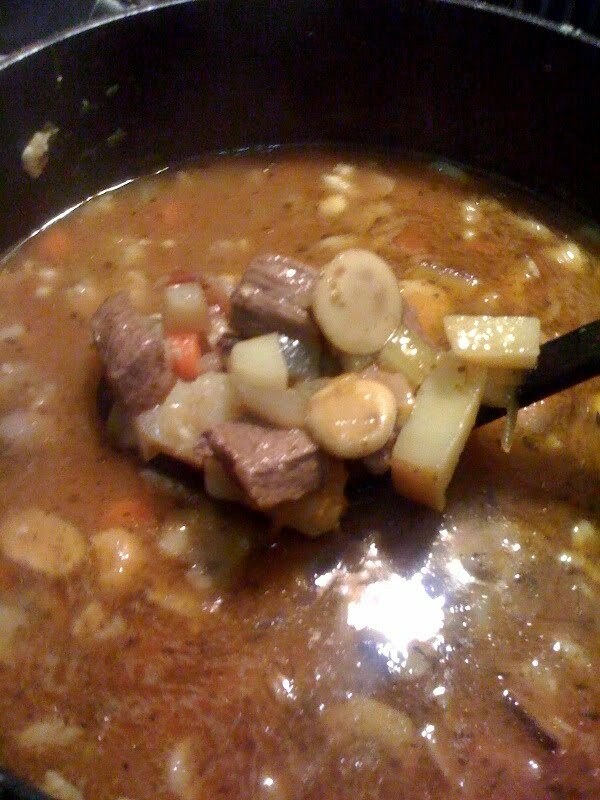 Stir in onion, garlic, carrots, and celery; cook until the vegetables are soft, about 8 minutes. Pour in vegetable broth. Stir in split peas, bay leaves, water, cayenne and Italian seasoning. Bring to a boil. 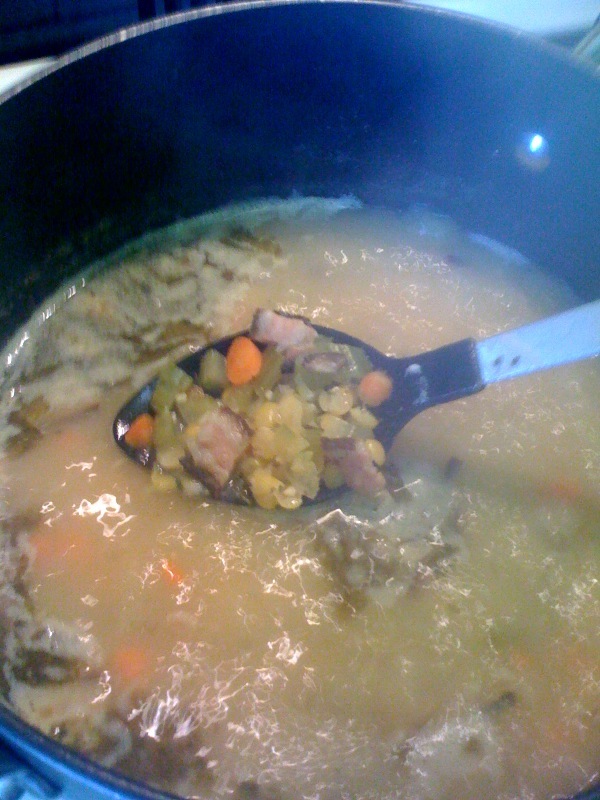 Reduce heat to low; cover, and simmer until peas are cooked, about 1 hour, stirring occasionally. 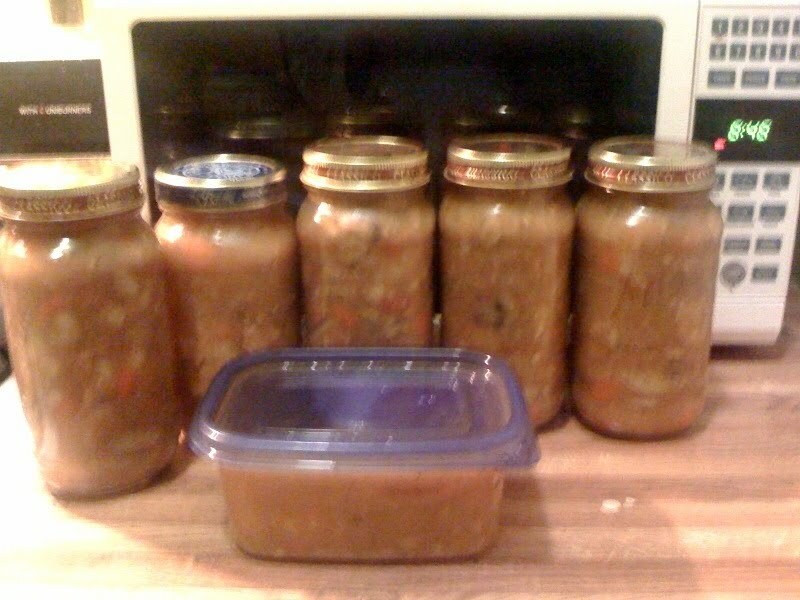 It makes quite a lot of soup and is filling. Despite the bacon and butter, it’s pretty low fat overall. I made a pot and had a few jars left over.